Alas, I have been absent from the blog for a while, as my family and I travelled to the UK to visit my husband's family over Easter. We had a super time, even if it was freezing and we did experience everything from hail to sleet and snow in the space of five minutes on one occasion. Because of the awful weather, we had a lot more indoor time than anticipated. 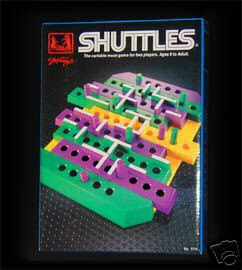 One of the saving graces was the Shuttles game I bought from http://righttolearn.com.sg/ before we left. My four year old son wanted to play it endlessly on the flight over, and was still not bored with it when we got to England. If you haven't seen this game before, it is brilliantly simple, as all good things in life are. You basically have to move your counters through a maze to the other side before your opponent moves hers in the opposite direction. But what makes it more challenging is that the board consists of seven 'shuttles' which can be moved from left to right so as to change the pattern of the maze. Players must try to think a couple of moves ahead and plan their attack. At first my son didn't understand this, but when he actually realised that he could plan a strategy, his game improved and so did his confidence. It was great to watch him thinking logically about what to do and trying different moves. This is what toys and games should be all about, and I was thrilled that he got so much out of this little game (we bought the travel version which was light and compact). If you are interested, go to http://righttolearn.com.sg/ and check out my post from March 12 which gives a review of the site. There are tons of educational toys at this site,so you really can't go wrong.